Buck tradition with your Easter eggs this year using any of these inspired decoration ideas. Transform egg shells into veritable works of art, using everything from customary vinegar-based dye to gold leaf and sparkly glitter. Continue to 2 of 47 below. For a pretty twist on traditional dye methods, try marbling your Easter eggs! A bit of nail polish in bright spring colors, a container of water, and a toothpick will do the trick. Continue to 3 of 47 below. Channel the cuteness of Valentine's candy hearts for these eggs–dye or paint a base color, then use contact paper snipped into letters to stick on fun messages. Crafter Beware: the scissor work can get tedious here without a Cricut Machine. Continue to 4 of 47 below. Impressionists take heed: this tutorial requires a bit of artistry, but the end result is absolutely dreamy. Use food coloring to paint flowers onto eggs' shells, then enhance with a black permanent marker. Gather a bunch of these together for a fun edible centerpiece at Easter brunch. Continue to 5 of 47 below. Use gold foil for a modern, fresh take on classic Easter egg dyeing. If you use faux eggs, you can have these as decor for many Easters to come! Continue to 6 of 47 below. 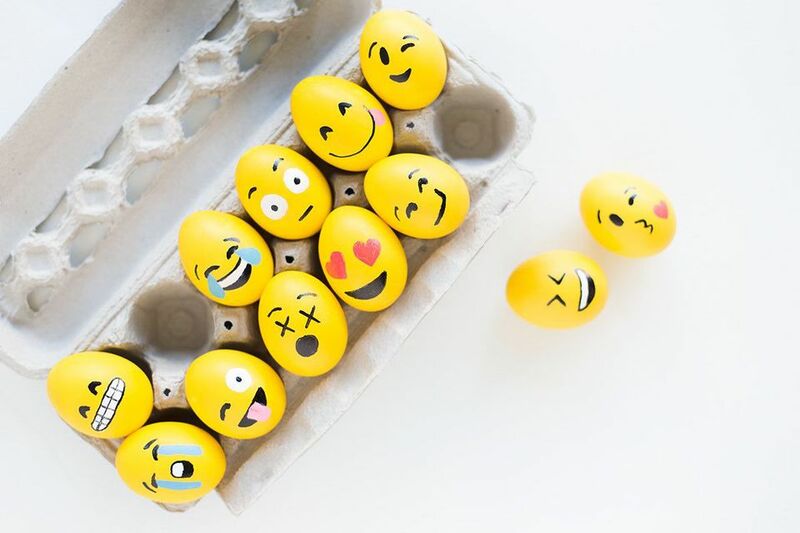 Give your Easter eggs a bit of personality by adding emoji faces! Get creative and try other emojis too: how cute would the Bunny Eared Girls look painted on a pastel egg? Consider paper mache eggs for this project -- the craft paint and permanent marker aren't too friendly on the taste buds. Continue to 7 of 47 below. Nail polish dripped into cool water gets marbled onto eggs in this tutorial. The final product is reminiscent of shibori–the Japanese indigo dyeing technique. Continue to 8 of 47 below. An Easter tradition in Mexico, Cascarón, or hollowed-out eggs filled with confetti, make a super special surprise for children. This helpful step-by-step teaches how to hollow your eggs, then dry, paint, and fill. Hide these around the yard for a fun Easter egg hunt! Continue to 9 of 47 below. Forage for wildflowers and greens to bring the freshness of Spring inside using this Mod Podge tutorial. There's no hand-painting involved here, so crafters of all skill levels can create a beautiful egg (or twelve). Continue to 10 of 47 below. Easter eggs take inspiration from fresh fruits here, and this tutorial also includes a great suggestion for an edible (but highly pigmented) paint alternative. Decorate a dozen to create your own fun "fruit" basket. Continue to 11 of 47 below. Pastel dyed shells provide the perfect backdrop for a sweet little bloom in these 3D pieces of edible art. Use hot glue to attach flowers (faux or real) to the egg for a bountiful bouquet of little beauties. Continue to 12 of 47 below. These avian-inspired showstoppers would make excellent decor for your buffet table. Card stock or heavyweight construction paper makes the wings and necks, which are simply glued to the naked egg. Create a whole flock to enhance your Easter celebration. Continue to 13 of 47 below. Speckle your eggs in black and white, then prop them up in colorful cups for a fun juxtaposition. Use a small paintbrush to create these tiny shell spots with craft paint. Continue to 14 of 47 below. Use faux moss and a little glue to make designs on hard boiled eggs a la this project. These would look great on a nature-inspired tablescape. Continue to 15 of 47 below. Sponge and splatter paint your Easter eggs into cosmic wonders. Again, this tutorial uses acrylic paint, so best to decorate plastic, non-edible eggs if you're attempting these other-worldly galaxy eggs. Continue to 16 of 47 below. Turn hard boiled eggs into sweet treats with this craft. Real hot fudge, sprinkles, and maraschino cherries top eggs set in ice cream cones. These look super cute set out on the counter, or even better, let guests create their own! Continue to 17 of 47 below. Adorable felt leaves top painted hard boiled eggs to mimic carrots here. Pair with a stuffed bunny to create a thematic display for your Easter celebration. Continue to 18 of 47 below. Honor Easter guests with their images Mod Podged onto hard-boiled eggs. This tutorial teaches the clever technique of printing photos directly onto facial tissue taped to printer paper, then trimmed and pasted to each egg. No special tools or papers required! Continue to 19 of 47 below. For the art enthusiast: mimic Pantone color cards by dipping a portion of each egg into regular egg dye, then apply a color label by printing onto temporary tattoo paper (or use the same facial tissue method from the DIY photo Easter eggs). Continue to 20 of 47 below. Brown paper mache eggs provide a nice contrast for a delicate white lace wrap. This is a great way to utilize those spare lengths of lace and trim gathering dust in your sewing box. Continue to 21 of 47 below. Similar to the carrot eggs, these veggie-inspired creations use a bit of additional material for their toppers. In this case, trim a bit of construction paper into spiky leaves to top yellow painted hard-boiled eggs. Continue to 22 of 47 below. Marry the Easter Bunny with Easter eggs in this craft. This tutorial includes a free printable template for the bunny ears and nose to make it extra friendly for beginners. Continue to 23 of 47 below. Washi tape, a hurried crafter's best friend, lends a hand by transforming into colorful sprinkles here. Place triangular bits of patterned or pastel tape around your hard-boiled eggs for a quick and easy decoration idea. Continue to 24 of 47 below. Add some glittery sparkle to your Easter decor with rhinestone covered eggs! Hot glue or stick-on gems in fun patterns to mimic a fancy Faberge laden with crystals. Continue to 25 of 47 below. Use a permanent marker to draw compelling patterns onto hollowed-out eggshells. Find inspiration in everything from contemporary art to ancient Greek vases. Continue to 26 of 47 below. Another great tutorial for beginners: This one utilizes dot stickers in fun colors to create pattern and design. Get creative and use other shapes of stickers, or dye your eggs first for a fun background! Continue to 27 of 47 below. Drip-dye your Easter eggs with food safe concentrated Kool-Aid Liquid. This technique is especially Instagram-worthy; as you drip color after color, your eggs become vibrant works of art. Continue to 28 of 47 below. Break out the Mod Podge once again to apply lovely little bunnies to blank hard boiled eggs. The completed look is entirely reminiscent of your favorite childhood storybooks–simple and whimsical. Continue to 29 of 47 below. A wispy little feather tops yellow eggs to create baby chicks that'll add some cuteness to any Easter decor. Finish the chicks' faces with bits of washi tape. Continue to 30 of 47 below. Transform Easter eggs into festive balloons! These clever DIYs will add some color to any spread, especially if you're celebrating a family birthday near Easter. Continue to 31 of 47 below. Repurpose body art into egg art! Regular temporary tattoos can be applied to hard-boiled eggs, quickly and easily, we might add, to reveal a vibrant and detailed image. This is a great one for kids–they'll love the impressive product sans any sort of tricky technique. Continue to 32 of 47 below. It's the details in this craft that make it so successful–toothpicks become ninja swords, and a bit of ribbon makes the perfect belt. These sneaky little guys are perfect to hide around the yard for a fun hunt! Continue to 33 of 47 below. No fancy tools needed here–mask off a simple shape (like a heart) with tape, then dip dye your Easter eggs. Peeling the tape reveals a shape created by the un-tinted negative space, and the entire look is almost too precious to eat (almost). Continue to 34 of 47 below. Experiment a bit with your Washi collection; try different thicknesses to criss-cross over eggs before dying, decorate already colored eggs, and snip it into fun shapes or polka dots to add interest. This tutorial gives a great starting point for your best Washi tape eggs. Continue to 35 of 47 below. Practice relief drawing with this project. Use an Easter sticker as a guide, then Sharpie-in little dots to form cute shapes. Continue to 36 of 47 below. Put leftover sprinkles to use decorating Easter eggs! Use a little craft glue to adhere sprinkles to each egg, then let dry completely. These end up quite delicate, but they're so pretty it may just be worth it. Continue to 37 of 47 below. Grab a permanent marker and scribble a few thematic words, lyrics to a meaningful song, or a seasonal blessing directly onto your eggshells. Continue to 38 of 47 below. Bright, bold colors and gold leaf combine for a striking look. Pro tip: make sure your boiled eggs are room temperature before painting or applying the gold leaf for best staying power. Continue to 39 of 47 below. Experiment with spray paint and faux eggs (non-plastic if you're using spray paint). Metallic gold looks especially chic when applied to the entire egg. Continue to 40 of 47 below. This project could not be easier thanks to sticky glue dots. Pop the glue stickers onto your eggs, then dip into fine glitter to achieve a sparkly polka-dotted shell! Continue to 41 of 47 below. Mimic iconic robin's egg by dying or painting your eggs a pretty light blue, then add gold speckles using a metallic permanent marker. Continue to 42 of 47 below. Transfer beautifully designed seasonal messages onto Easter eggs using temporary tattoo paper. This tutorial includes a template of phrases for your crafting ease. Continue to 43 of 47 below. Add texture to your annual eggs by wrapping them in Baker's Twine. A basketful of these, especially in multiple sizes, make an interesting centerpiece. Continue to 44 of 47 below. Chalk-tinted Epsom salt looks like delicate pastel glitter, and it adds great sparkle when applied to plastic Easter eggs. Continue to 45 of 47 below. Give your Easter eggs a bit of three-dimensional shine with golden confetti. Brush on patches of glue, then roll them into the confetti bits for party-ready eggs. Continue to 46 of 47 below. Break out your paint brushes and swipe watercolor patterns over your eggshells. Think chevron, stripes, and polka dots! Continue to 47 of 47 below. Use spray paint to achieve a trendy ombre finish on hollowed-out or wooden Easter eggs.